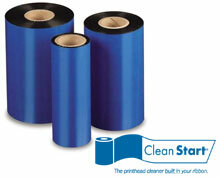 AirTrack Premier Ribbons offer you a true compatible choice when searching for many of your industry standard ribbons. All of our Premier Ribbons are produced with the highest quality materials, precision equipment and are regularly tested to ensure the products exceed your highest expectations. And better yet, we recycle nearly 100% of our production waste to convert to fuel pellets. We produce Wax, Wax-Resin, and Resin ribbons in various sizes and colors. We strive to offer the highest quality product at a superior price. The AirTrack 05100BK08945-COMPATIBLE is also known as Air Track	05100BK08945-COMPATIBLE	or 05100BK08945COMPATIBLE	.